Staphylococcus capitis is an emerging opportunistic pathogen of humans, and found as a colonizer of the human gut. Here, we report a case of S. capitis subsp. urealyticus infection. The strain LNZR-1 was isolated from the blood culture of a patient with sigmoid colon cancer. It was found to be resistant to some important antibiotics, such as linezolid, a highly effective antimicrobial against clinically important Staphylococci pathogens. However, data on the genetic resistance mechanisms in S. capitis subsp. urealyticus are only sparsely available. The draft genome of S. capitis subsp. urealyticus strain LNZR-1 was sequenced by using next-generation sequencing technologies. Sequence data assembly revealed a genome size of 2,595,865 bp with a G + C content of 32.67%. Genome annotation revealed the presence of antibiotic resistance genes conferring resistance against some of the tested antibiotics as well as non-tested antibiotics. The genome also possesses a lot of genes that may be related to multidrug resistance. 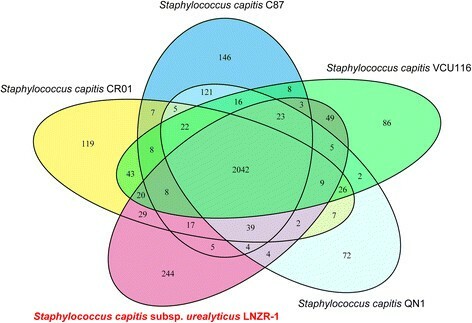 Whole genome comparison of the LNZR-1 with five other S. capitis strains showed that some functional regions are highly homologous between the six assemblies made herein. The LNZR-1 genome has high similarity with the genomes of the strains VCU116 and CR01, although some short stretches present in the genomes of strains VCU116 and CR01 were absent in the strain LNZR-1. The presence of a plethora of genes responsible for antibiotic resistance suggests that strain LNZR-1 could present a potential threat to human health. The comparative genomic analysis of S. capitis strains presented in this study is important for better understanding of multidrug resistance in S. capitis. Staphylococcus capitis are Gram positive cocci belonging to the Coagulase-Negative Staphylococci group (CoNS) that is frequently found on the human skin and mucosa , and even in the human gut . Although infection caused by this species is rare compared with S. aureus, infection cases associated with S. capitis increase gradually . Recent reports indicate its emergence as a significant pathogen causing nosocomial and bloodstream infections, meningitis, prosthetic valve endocarditis, and late-onset sepsis -. This bacterium is a subtype of CoNS and the pathogenesis of S. capitis is mainly due to its ability to produce a slimy biofilm, enabling it to adhere to the medical devices such as prosthetic valves and catheters; this makes them difficult to be controlled or cleared by immune responses or antibiotic therapy . The S. capitis subsp. urealyticus strain LNZR-1 described herein was isolated from the blood culture of a patient with sigmoid colon cancer. Antimicrobial susceptibility assay revealed that it was resistant to some important antibiotics, such as linezolid. In order to elucidate the molecular mechanisms behind the multidrug resistance of S. capitis subsp. urealyticus LNZR-1 clone, here, we report the sequencing and annotation of its genome, together with a functional level genomic comparison with other important S. capitis strains, namely QN1 , CR01 , VCU116, C87 and SK14. The blood samples were collected from a patient with sigmoid colon cancer from the Fourth Affiliated Hospital of Harbin Medical University, in March 2013. S. capitis subsp. urealyticus strain LNZR-1 was isolated after cultivation. It is a Gram positive, coccus-shaped bacterium growing on 5% sheep blood enriched Columbia agar (BioMérieux, Marcyl’Etoile, France) at 37°C. Cell morphology, motility and sporulation were examined by using scanning electron microscopy. Late log-phase cells were harvested and lysed with EDTA and lysozyme, followed by proteinase K and RNase digestion. Genomic DNA was extracted using a DNeasy Blood & Tissue Kit (Qiagen, Germany) according to the manufacturer’s recommended protocol. Agarose gel (0.7%) electrophoresis was used to evaluate the genomic DNA purity and the concentration was measured using a NanoDrop 1000 Spectrophotometer (Thermo Fisher Scientific, USA). The genomic DNA was stored at -20°C. Strain LNZR-1 was identified by 16S rRNA gene sequencing as described earlier . PCR amplification was performed by using primers 27 F (5′-AGAGTTTGATCCTG GCTCAG-3′) and 1500R (5′-AGAAAGGAGGTGATCCAGGC-3′). Agarose gel (1%) electrophoresis was used to separate amplified PCR fragments which were subjected to sequencing of the 16 s rRNA gene. Phylogenetic analysis was conducted based on the 16S rRNA nucleotide sequence. The representative 16S rRNA nucleotide sequence of strain LNZR-1 was compared against the most recent release of the EzTaxon-e database . Phylogenetic inferences were made using Neighbor-joining method based on Tamura-Nei model within the MEGA 6.06 . Antimicrobial susceptibility was determined by the disk diffusion method on Mueller-Hinton agar recommended by the Clinical and Laboratory Standards Institute guidelines . The following antimicrobial agents were tested: sulfamethoxazole, gentamicin, oxacillin, tetracycline, linezolid, clindamycin, ciprofloxacin, cefoxitin, cefazolin, cefuroxime and vancomycin. The other reference strains used for this study were Escherichia coli ATCC 25922 and Klebsiella pneumoniae ATCC 700603. The genome of S. capitis subsp. urealyticus strain LNZR-1 was sequenced using a standard run of Illumina HiSeq 2000 sequencing technology which generated paired-end libraries (500-bp insert size) according to the manufacturer’s instructions. Clean reads were assembled into scaffolds using Velvet version 1.2.07 , and Post-Assembly Genome Improvement Toolkit (PAGIT) was used to extend the initial contiguous sequences (contigs) and to correct sequencing errors . Open reading frames (ORFs) were identified using Glimmer version 3.0 . Transfer RNAs and ribosomal RNA genes rRNAs were detected by tRNAscan-SE  and RNAmmer 1.2 software , respectively. The genome was annotated using the RAST (Rapid Annotation using Subsystem Technology) server . The classification of some predicted genes and pathways was analyzed using the Clusters of Orthologous Groups of proteins (COGs)  and Kyoto Encyclopedia of Genes and Genomes (KEGG)  databases. Functional annotation was also performed by using public database of National Centre for Biotechnology Information (NCBI). For comparative analysis, we downloaded the reference genome sequences of the closest genetic relatives of strain LNZR-1 and representative strains from the NCBI database: S. capitis C87 (ACRH00000000), S. capitis SK14 (ACFR00000000), S. capitis CR01 (CBUB000000000), S. capitis VCU116 (AFTX00000000) and S. capitis QN1 (AJTH00000000). Mauve in the progressive mode was used for whole genome comparison . Bits (AB) means bits score when using gene A as query while B as database; Bits (BA) means bits score when using gene B as query while A as database; Bits (AA) or Bits (BB) are bits score when using gene A or B to align with itself, respectively. BBHs with SRVs no less than 0.3 was considered as one candidate orthology group (SRVs Table in Additional file 1: Table S1). Biochemical features were tested by using Vitek2 Compact (bioMérieux, Marcy l’Etoile, France). Positive reactions were observed for arginine dihydrolase 1, L-lactate alkalinization, bacitracin resistance, mannose, growth in 6.5% NaCl, O/129 resistance (comp.Vibrio.) and optochin resistance. Negative reactions were obtained for D-amygdalin, phosphatidylinositol phospholipase c, D-xylose, beta-galactose, Ala-Phe-Pro arylamidase, alpha-galactosidase, cyclodextrin, L-aspartate, beta- galactopyranosidase, alpha-mannosidase, phosphatase, leucine arylamidase, L-proline arylamidase, beta-glucuronidase, L-pyrrolidonyl-arylamidase, beta-glucuronidase, alpha-galactosidase, alanine arylamidase, tyrosine arylamidase, D-sorbitol, urease, D-galactose, D-ribose, lactose, N-acetyl-D-glucosamine, methyl-B-D-glucopyranoside, D-maltose, novobiocin resistance, D-mannitol, pullulan, D-raffinose, salicin, D-trehalose and sucrose. Based on the morphological and biochemical characterization, the strain LNZR-1 was identified as S. capitis. Bioinformatics assessment of potential contamination of the genomic library by allochthonous microorganisms was achieved using the BLAST non-redundant database. Cells of strain LNZR-1 are cocci, 0.7 to 1.2 μm in diameter, occurring predominantly singly or in pairs (Additional file 2: Figure S1). To assess the purity of strain LNZR-1, the 16S rRNA gene sequence of strain LNZR-1 was aligned with sequences of other members of the genus Staphylococcus retrieved from the EzTaxon database. Phylogenetic tree indicated the taxonomic status of strain LNZR-1 clearly classified into the same branch with species S. capitis subsp. urealyticus GTC 727T (Figure 1). Phylogenetic tree highlighting the position of S. capitis subsp. 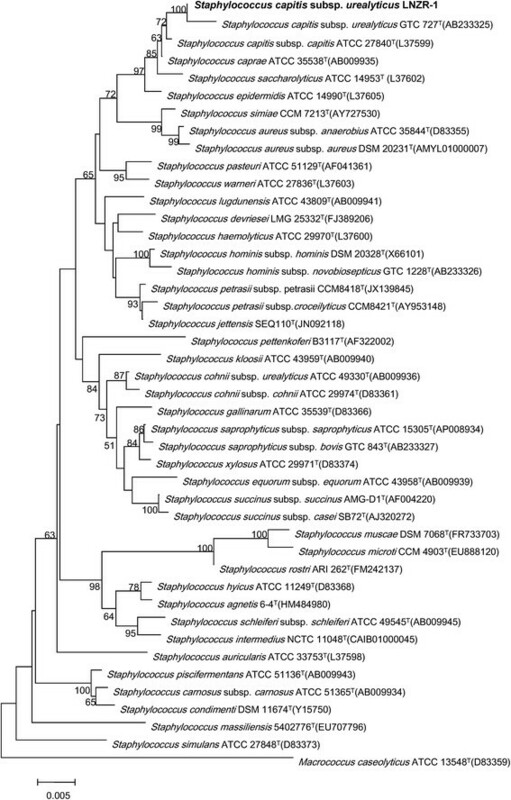 urealyticus strain LNZR-1 relative to other type strains within the genus Staphylococcus. The strains and their corresponding GenBank accession numbers for 16S rRNA genes are shown following the organism names. Numbers at the branching nodes are percentages of bootstrap values based on 1,000 replications. Bootstrap values greater than 50% are shown at the branch points. Macrococcus caseolyticus ATCC 13548T was used as an out group. The scale bar represents 0.005 substitutions per nucleotide position. A total of 2,214,438 available reads were filtered from 5,619,015 raw reads. Quality control was performed with following criteria: reads that contained more than one N bases were removed. Reads that contained more than 50 bases with low quality (Q30) were removed. Reads with more than 10 bases with low quality (Q30) or N bases in the tail of the reads were trimmed. For sequences which lost their mated reads were considered as single reads and were not used in the downstream analysis (Additional file 1: Table S1). 177 initial contigs (best kmer length 57) was assembled by Velvet; then 90 prolonged contigs were assembled based on PAGIT flow (PAGIT is just a flow and it actually does not provide any practically available scripts or programs). The assembled genome of S. capitis subsp. urealyticus revealed a genome size of 2,595,865 bp and a G + C content of 32.67% (90 scaffolds). The largest contig consisted of 319,806 bp and the length of N50 contig was 66,677 bp. These scaffolds contain 2430 coding sequences (CDSs), 8 tRNAs (excluding 1 Pseudo tRNA) and 2 incomplete rRNA operons (1 small subunit rRNA and 1 large subunit rRNA). The properties and the statistics of the genome are summarized in Table 1. RAST server based annotation of the whole genome describes the subsystem distribution of strain LNZR-1 (Figure 2). Genes responsible for amino acids and derivatives (264 ORFs), carbohydrates (209 ORFs), and protein metabolism (175 ORFs) were abundant among the subsystem categories. 1934 genes were categorized into COGs functional groups (including putative or hypothetical genes, Figure 3). 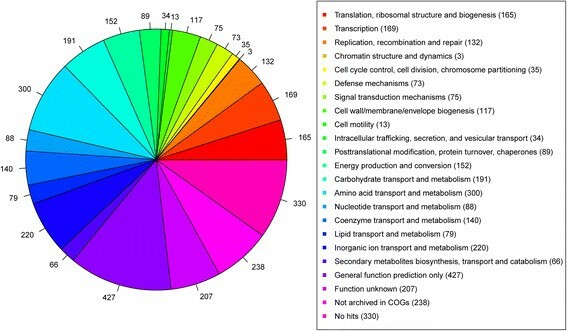 For COGs distribution, R (general function prediction only; 427 ORFs), E (amino acid transport and metabolism; 300 ORFs), P (inorganic ion transport and metabolism; 220 ORFs), S (function unknown; 207 ORFs), and G (carbohydrate metabolism and transport; 191 ORFs) were abundant categories (>10% of total COGs matched counts). Subsystems distribution statistic of S. capitis subsp. 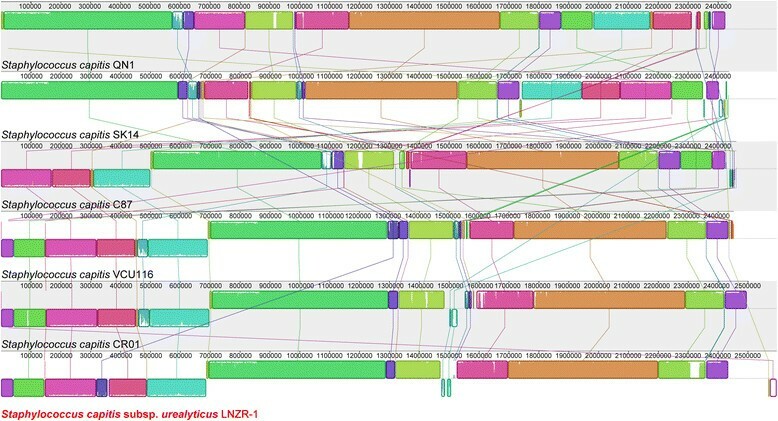 urealyticus strain LNZR-1 based on genome annotations performed according to RAST server. 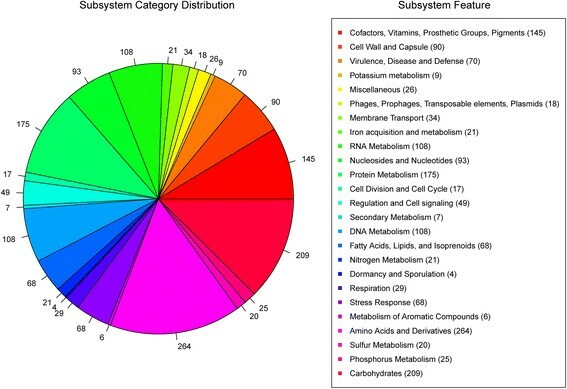 The pie chart presents the abundance of each subsystem category and the count of each subsystem feature is listed in parentheses at the chart legend. COGs distribution of S. capitis subsp. urealyticus strain LNZR-1. Statistics of annotated genes for LNZR-1 were based on COG database. The in vitro antibiotic sensitivity tests demonstrated that this strain is susceptible to vancomycin and sulfamethoxazole, and resistant to tetracycline, gentamicin, ampicillin, methicillin, linezolid, clindamycin, cefoxitin, cefazolin, cefuroxime and ciprofloxacin. To gain insights into the genomic basis for the observed antibiotic resistance traits, the genome was searched for specific genes known to confer antibiotic resistance. The results revealed the presence of antibiotic resistance genes conferring resistance against some of the tested antibiotics as well as non-tested antibiotics (Table 2). MDR-type ABC transporters, multidrug and toxin extrusion (MATE) family efflux pumps and multidrug major facilitator superfamily (MFS) transporters were also detected in the genome. Furthermore, 10 putative MarR family transcriptional regulators were found in the genome, which are recognized as a widely conserved group of multiple antibiotic resistance regulators that respond to diverse antibiotics . Whole genome comparison of the LNZR-1 with S. capitis C87, S. capitis SK14, S. capitis CR01, S. capitis VCU116 and S. capitis QN1 showed that some functional regions are highly homologous between the six assemblies (Figure 4). The LNZR-1 genome has high similarity with VCU116 and CR01, although some short stretches present in the genome of VCU116 and CR01 were absent in LNZR-1. Furthermore, LNZR-1, C87, CR01, VCU116 and QN1 revealed a large number of orthologous genes (Figure 5). Venn diagram indicates the presence of a large core-genome. These five S. capitis strains shared 2042 CDS in the genome. A particular overlap between C87 and QN1 became evident; these two chromosomes shared 121 orthologous CDS exclusively. The chromosome of LNZR-1 overlapped less with the C87 and QN1, which shared 5 and 4 exclusively orthologous CDS, respectively. In addition, 244 CDS from the LNZR-1 genome were classified as unique. MAUVE alignment of the genomes of S. capitis subsp. urealyticus LNZR-1, S. capitis C87, S. capitis SK14, S. capitis CR01, S. capitis VCU116 and S. capitis QN1. MAUVE identifies and aligns regions of local collinearity called locally collinear blocks (LCBs), a region without rearrangement of homologous backbone sequence. LCBs below a genome’s center line are in the reverse complement orientation relative to the reference genome. Lines between genomes trace each orthologous LCB through every genome. Venn diagram representing the pan-genome of S. capitis subsp. urealyticus LNZR-1, S. capitis C87, S. capitis CR01, S. capitis VCU116 and S. capitis QN1. Numbers inside the Venn diagram indicate the number of genes found to be shared among the indicated genomes. In recent times, the alarming spread of antibiotic resistance has severely limited the treatment options for nosocomial infections. Currently, the antibiotics linezolid, vancomycin and daptomycin form an empirical therapy towards the control of serious infections caused by Staphylococci. However, the overuse of these antibiotics could have resulted in the emergence of multidrug resistant bacteria. Despite untiring efforts directed at the analyses of intermediately resistant clinical isolates, the explicit mode of the development of resistance to these antimicrobials remains obscure. Further studies by using high-throughput mRNA sequencing (RNA-Seq) experiments to explore differential RNA expression levels under selective antibiotic pressures are warranted. Further studies are required to elucidate the resistance mechanisms, and information on these mechanisms could potentially aid in antibiotic development. This research was approved by the Research Ethics Committee of the Fourth affiliated Hospital of Harbin Medical University, and informed consent was obtained from the patient. This Whole Genome Shotgun project has been deposited at DDBJ/EMBL/GenBank under the accession JGYJ00000000. The version described in this paper is version JGYJ01000000. Xiaoxia Li, Min Lei contributed equally to this work. This work was supported by the National Natural Science Foundation of China (No. 81171657) and Specialized Research Fund for the Doctoral Program of Higher Education (No.20112307110021). XXL and XFJ designed the study. XXL, ML, YLS, KWG, LL and HYL performed the experiments. XXL, HYL and XFJ analyzed the data and wrote the manuscript. XFJ checked and edited the manuscript. All the authors have read and approved the final manuscript.